Normally the Pope holds his Wednesday general audiences in the Paul VI Hall, which seats several thousand. 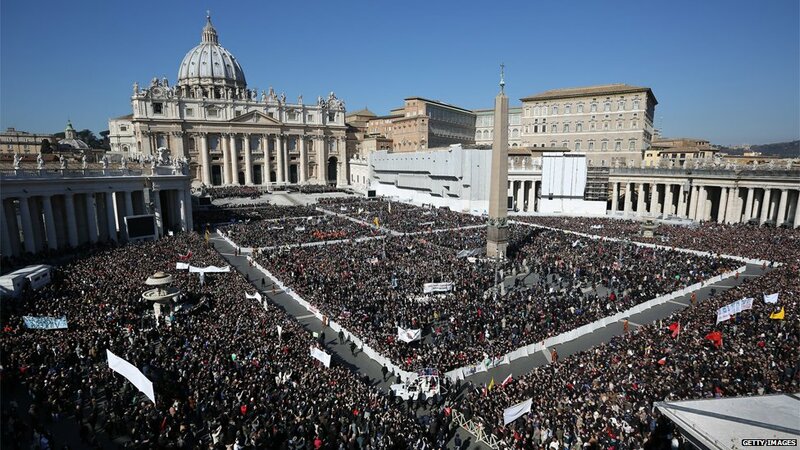 Today, for his last audience, Benedict moved to the piazza of St Peter’s to allow approximatley 200,000 faithful to join him. There was brilliant sunshine. 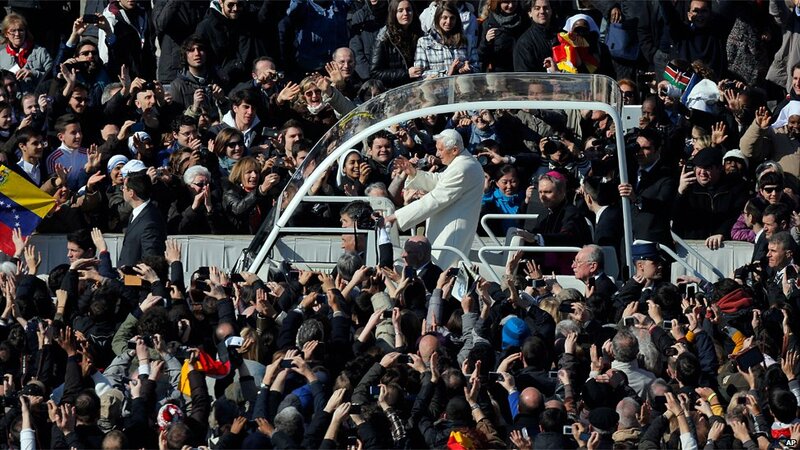 He made a lap or two one last time in an open-sided popemobile. In recent months, I felt that my strength had decreased, and I asked God earnestly in prayer to enlighten me with his light to guide me to the right decision, not for my sake, but for the good of the Church. I have taken this step in full awareness of its gravity and also its novelty, but with a deep peace of mind. Loving the Church also means having the courage to make tough choices, and suffering for them, always holding as first the good of the Church and not oneself. The “always” is also a “forever” – there can be no return to private life. My decision to renounce the exercise of active ministry does not deny this fact. I am not returning to private life, to a life of travel, meetings, receptions, conferences and so on. I am not abandoning the cross, but I am remaining at the foot of the Crucified Lord. I will no longer hold the power of the office for the government of the Church, but by rendering the service of prayer I shall rest, so to speak, in the domain of St. Peter. St. Benedict, whose name I bear as Pope, is a great example of this. He showed us the way to a life which, active or passive, belongs wholly to the work of God. 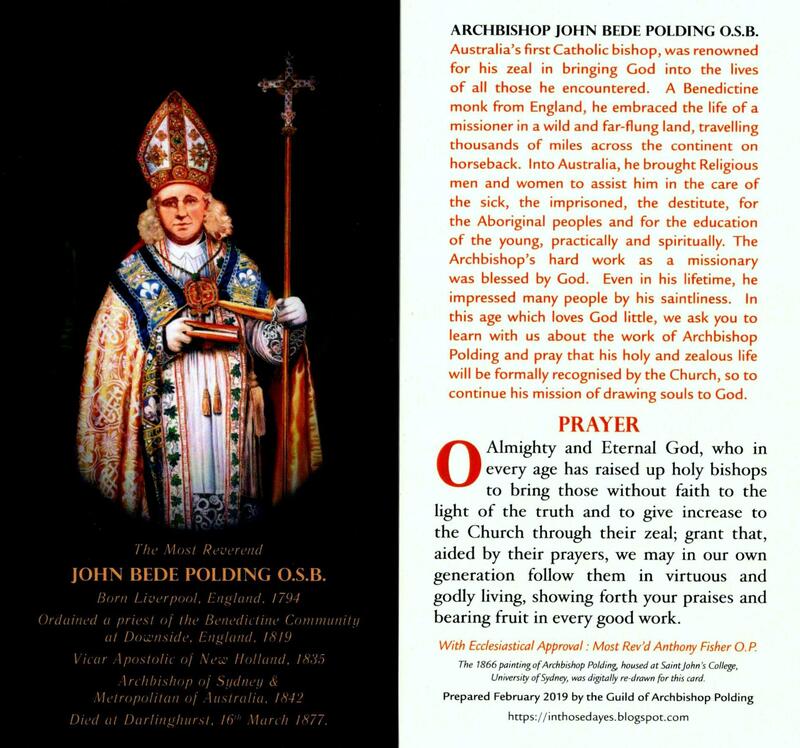 Cardinal Dziwisz of Krakow, one-time secretary to Pope Bl John Paul II, obliquely rebuked Pope Benedict in the wake of the announcement of the papal abdication by stating, with JPII in mind, that “one does not come down from the cross”. 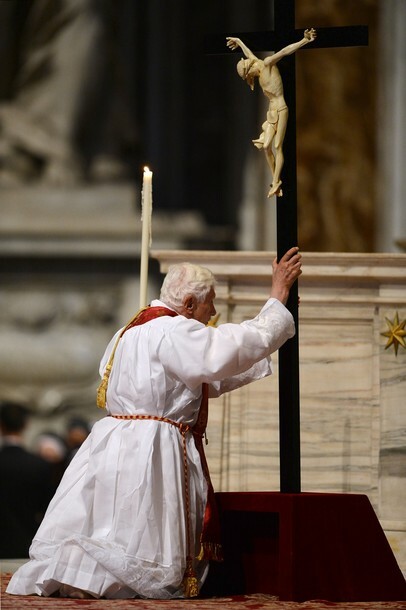 Pope Benedict seems almost to be answering the Cardinal’s rebuke by stating he is not abandoning the cross, but remaining at the foot of the cross. This seems to reveal a profound and sensitive humility. Benedict sees himself not as Christ, but as Christ’s faithful disciple who, with Mary, remained at the foot of Christ’s cross when all others had fled. He will now, like a Benedictine, give his last days over fully to contemplation of the Cross in prayer, and in the “work of God”, the liturgy (and, we can at least hope, in writing). In this passage he seems to signal that he intends to remain in the Vatican, the domain of St Peter, as his cloister for contemplation, as the Golgotha on which he can contemplate the crucified Lord. An Easter morning constitutional. Some wild tulips. An interesting property for sale. Bescar Lane station straddles the crossing, a platform either side. A lesson learned about railway crossings: in the south the gates come down a couple of minutes before the train is due; up here it is about 12 seconds. A fetching view of chiesa mia across the fields, Scarisbrick Hall's tower in the background. In case you've not caught on to the full significance of the last post, on the grapefruit knife. Behold, function marries form. Is it more than a spire, a cathedral that is falling? 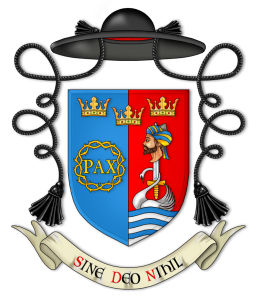 Fr Hugh Somerville-Knapman OSB, 50, is an Australian Benedictine monk and priest in England.